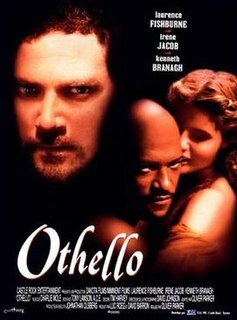 Otello is a 1986 film based on the Giuseppe Verdi opera of the same name, which was itself based on the Shakespearean play Othello . 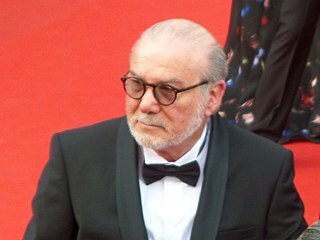 The film was directed by Franco Zeffirelli and starred Plácido Domingo in the title role, Katia Ricciarelli as Desdemona and Justino Díaz as Iago. For the movie's soundtrack, Lorin Maazel conducted the Orchestra and Chorus of the Teatro alla Scala. The film premiered in West Germany on 28 August 1986 and received a U.S. theatrical release on 12 September 1986. It was nominated for a Bafta Award and a Golden Globe for Best Foreign Language Film. With only a few exceptions, the film follows the same plot as the opera. 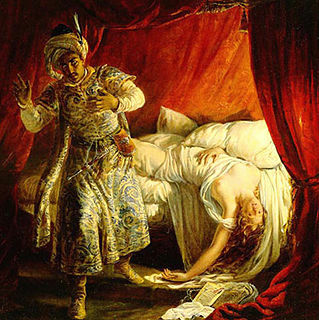 Iago plots and brings about Otello's downfall by convincing him that his wife Desdemona is engaged in an affair with the young lieutenant Cassio, provoking Otello to murder her in a blind rage. However, in a major change from the opera, Otello kills Iago at the end by throwing a spear at him, while in the stage version he only wounds him with his sword. Justino Díaz is a Puerto Rican operatic bass-baritone. In 1963, Díaz won an annual contest held at the Metropolitan Opera of New York, becoming the first Puerto Rican to obtain such an honor and as a consequence, made his Metropolitan debut on October 1963 in Verdi's Rigoletto as Monterone. Yoram Globus is an American-Israeli film producer, cinema owner, and distributor. He is most known for his association with The Cannon Group, Inc., an American film production company, which he co-owned with his cousin Menahem Golan. Heraklion or Heraclion is the largest city and the administrative capital of the island of Crete and capital of Heraklion regional unit. It is the fourth largest city in Greece. According to the results of the 2011 census, the municipality's population was 173,993 and according to the results of 2011 census, the metropolitan area has a population of 225,574 and it extends over an area of 684.3 km2 (264.2 sq mi). For the most part, the film follows the original score of the opera with several noticeable exceptions. The entire "Willow Song" ("Salce, salce"), Desdemona's solo aria, which is largely considered one of the most beautiful moments in the work, is omitted. However, her "Ave Maria", which follows immediately, is retained in the film. There are, at various points, smaller additional cuts in the music, such as the moment at the end of the storm scene when the chorus is cut short and the film skips to the recitativo between Iago and Roderigo. This contrasts with stage productions of Otello, where the opera is rarely cut. There are also two additions: the extra music from the rarely performed third act ballet (written for the opera's Paris premiere) is inserted into the festivities of the first and third acts in the film. In some scenes, Zeffirelli was able to use the medium of film to show aspects of his interpretation that could not be done onstage. In the movie, when Iago is informing Otello about Cassio's supposed dream in which he apparently said to Desdemona, "Let us hide our loves", we see Cassio singing the words, not Iago, as in the original stage version. Here Zeffirelli is showing the audience the image of Iago's fabricated dream as Otello is imagining it. Another of Zeffirelli's interpretive decisions was to show, complete with screams and sound effects, a flashback of marauding soldiers attacking an African village and snatching Otello (as a baby) from his mother, while the adult Otello and Desdemona sing their Act I love duet. On the soundtrack album of the opera, released by EMI, the music is presented with no cuts or additions, as it is when Otello is performed on the stage. The soundtrack album, however, has not proved to be as popular as Plácido Domingo's first recording of the opera, conducted by James Levine and released in 1978 by RCA Victor. Othello is a 1951 tragedy film directed and produced by Orson Welles, who also adapted the Shakespearean play and played the title role. Recipient of the Grand Prix du Festival International du Film at the 1952 Cannes Film Festival, the film was distributed by United Artists when it was released in the United States in 1955. 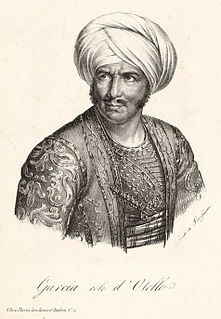 Othello was filmed on location over a three-year period in Morocco, Venice, Tuscany and Rome and at the Scalera Studios in Rome. Pagliacci is a 1982 Italian film of Ruggero Leoncavallo's opera Pagliacci, directed by Franco Zeffirelli. All the actors, including Plácido Domingo and Teresa Stratas in the starring roles, were opera singers who sang their own parts. Pagliacci was shot at Milan's La Scala opera house and on a movie sound stage. Georges Prêtre conducted the Orchestra and Choir of La Scala. 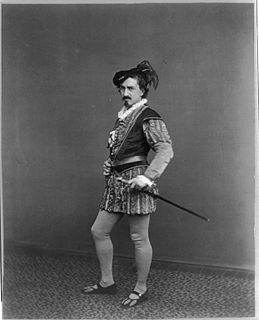 Frank Little was an operatic lyric tenor and educator. 1 2 Fawkes, Richard (2000). Opera on Film. London: Duckworth. pp. 188–9. ISBN 0-7156-2943-3. ↑ "1986 Award Winners". National Board of Review of Motion Pictures. 2016. Retrieved 31 October 2016. ↑ "Festival de Cannes: Otello". festival-cannes.com. Retrieved 2009-07-11. ↑ Canby, Vincent (12 September 1986). "Film: Placido Domingo in Zeffirelli's 'Otello'". New York Times. Retrieved 10 January 2019. ↑ Scovell, Jane (September 1987). "Domingo: Giving his Best". Opera News.